Silicon Valley is a show defined by near-constant conflict. In an industry where you can go from hosting million-dollar parties to scrounging for table scraps within months, the push for new ideas is never-ending. Those who can’t come up with something find themselves forced to buy, beg, borrow, or steal their way until they get ahead or at least buy themselves some time to come up with the next thing. With the exception of Big Head and his near-meteoric rise to the top—it feels like the logical conclusion that he’ll wind up CEO of Hooli by the end of the series—everyone on this show is in a constant state of planning and hustling, chasing funding and inspiration in equal measure. That’s been especially true in season two, living up to Monica’s promise to Richard in the first season finale that his success at TechCrunch Disrupt was only the beginning of his uphill climb. Richard, Erlich, Jared, and the rest of the Pied Piper team have been on the defensive since the end of the premiere, going from multi-million dollar potential to industry pariahs, fighting off buyouts, corporate rivals, and their own worst impulses. The end result has been a solid season of television, with the constant pressure producing both a driven narrative and some excellently profane comedy. “Two Days Of The Condor,” the second season finale, is an episode where events finally accelerate to be a matter of life and death. Two lives are at stake: that of the unfortunate technician who tumbled to the bottom of the ravine at the end of “Binding Arbitration” and is now living his own 127 Hours experience, and that of Pied Piper as it awaits the judge’s arbitration. The mood is fatalistic, with Hooli engineers ready to pick the company’s corpse the minute a ruling is made (Richard: “It’s like they think they won.” Gilfoyle: “Is there anything that makes you think they haven’t?”). Yet in true Silicon Valley fashion, human misery provides a bright spot: since the feed is still active, traffic has gone way up. Both of these things add up to give “Two Days Of The Condor” the highest energy levels the show has ever experienced. Once the feed starts to go viral—aided by BuzzFeed articles, a retweet from Manny Pacquiao (not the Filipino legislator), and YouTube guitar soundtracks to the tech’s whimpering—traffic shoots up beyond any expected metrics. Dinesh and Gilfoyle’s efforts to jury-rig the system to work regardless of what it does to the house is excellently constructed, screaming at each other at the same time they’re running cords throughout. It’s a sequence that perfectly encapsulates the ramshackle nature of this startup, and an oddly touching gesture for a company seemingly about to die. It’s a last stand type of comedy, that if this is to be their ending than they will go up in flames—literal ones if necessary. From those flames emerges the most surprising development of the episode: Erlich returning to doing actual technical work. Erlich’s arc this season has been one of continual failures—being excoriated on the stand, failing to sell Jian-Yang’s app, an inability to earn Russ’s attention—so his decision to sell the house and shut the incubator down is an entirely rational one. Yet at the same time, events such as his behavior in “Server Space” have made clear that his houseguests hold value to him beyond reasons of money or ego. He couldn’t kick them out then and he can’t do it now, even with a cash offer (one that produces some great T.J Miller-style umbrage when poor word choice on the realtor’s part means he can throw her off the “transom” of his house). It’s a great moment for the character, and an equally great moment for Jared after his speech on the company’s value, given how his earnestness so seldom gets the validation he deserves. Jared’s affection for this company also makes the final reveal of the judge’s decision all the more rewarding. While a final victory over Hooli’s lawsuit feels implausible after all the ways Pied Piper has shot itself in the foot they keep pulling from their mouth, it fits in with Silicon Valley’s track record of small details turning out to make all the difference. Ron LaFlamme citing Jared’s breach of contract in “Runaway Devaluation” came off as a throwaway gag to make fun of how he doesn’t go by his real name, and it’s oddly rewarding to see it come back in this manner. And it’s also a move that totally fits Gavin’s blithe sense of entitlement and latent pettiness that he’d introduce something so detrimental to his own employees as to be illegal and not even think there was a problem until someone pointed it out. Richard’s own madcap efforts to cancel the request are neatly balanced by how much the rest of the team dawdles in actually executing the deletion. It would be easy for this last-minute delay to be an obvious tool on the part of the writers, but it makes perfect sense given the circumstances. After successfully keeping the feed alive to the end—at the cost of some holes and house fires—the last thing any of them want to do is consign their labor to the abyss, hence Dinesh’s quest for the perfect lemon for his beer. And the marrying of the two sequences, Richard finally begging them to stop at the exact moment Gilfoyle presses delete, is a moment that takes the breath away as Pied Piper is in a quantum state of alive and dead (channeling last week’s Schrödinger’s cat analogy). How appropriate it is then that what saves everything is the jury-rigged code/server combo, which crashes in the one interval where it’s appropriate. Once again, the Pied Piper team has snatched success from the jaws of failure. Yet what defines the finale more than any of these actions is how it turns that formula on its head, and creates Richard’s greatest failure from what should be his most triumphant moment. He’s won the lawsuit and the race, and with one phone call from Monica it’s all rendered moot. Raviga renews its interest in his company post-lawsuit, pushing Russ back into the three-comma club by buying out his interest—and more importantly, his two board seats. 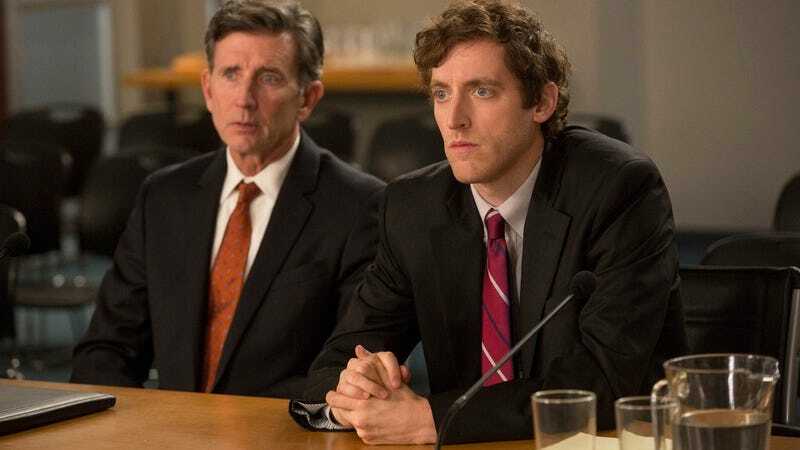 The threat that Dinesh and Gilfoyle saw all the way back in “Fiduciary Duties” comes to pass, as Laurie takes advantage of her 3-2 majority and has Richard removed as CEO. It’s a development that’s heartbreaking to witness after everything it took to keep the company alive, and yet it’s also the natural outcome of this season. As the back half of this season has gone out of its way to illustrate, for all his technical brilliance Richard was a fairly terrible CEO. He fumbled his way through meetings, allowed himself to be talked into questionable deals, and was never able to master the smooth amorality that Gavin or EndFrame pulled off in their dealings with him. (Even more tragically, the missteps Laurie cites—Homicide and Intersite—were ideas he had to be talked into.) He played the game to the best of his ability, but Laurie’s calculating mind saw only the negatives and had him removed. It deflates the room and the finale’s sense of victory, the team that’s ultimately loyal to and supporting of Richard left with nothing to say. How far this team’s loyalty to Richard goes forms one of the many outstanding questions for next year. Going back to the first season finale, “Two Days Of The Condor” paints a more ambiguous picture of what season three will look like. Laurie’s only shown herself briefly this season, but those scenes depict a competitive precision unlikely to mesh with the team’s Dinesh, Gilfoyle, and Erlich. Richard can’t be out of Pied Piper entirely thanks to his board seat and high-value technical skills, but how long until being on the outside pushes him to the dark side he wasn’t fully willing to embrace this year? (Ditto Gavin Belson, who’s likely to be forced out as Hooli CEO and doesn’t seem like he’ll adapt well to life on the outside.) It’s unclear what’s coming next, but it’s certain to be contentious. And if season two made anything clear, it’s that contentious is where Silicon Valley thrives. This week’s closing track: “Changing Of The Guards,” Pusha T featuring Diddy. One major regret of the episode is that we were denied a scene between Laurie and Russ, after “Bad Money” all but assured us one was coming when Laurie refused to ever be in the same room as him. The deliveries and facial expressions from Suzanne Cryer in recounting the meeting do assuage the loss somewhat, but there was major comedic potential seeing those two together and I’m sorry we didn’t get to see it. On that note, someone please create a GIF of Russ pantomiming the way his car doors open. No bigger sign of Gavin’s declining fortunes than his guru jumping ship to support Big Head and offering to manage his aura. Hopefully he knows how to drive the boat. Monica’s persecution at work from “White Hat/Black Hat” continues with the sight gag of an anti-smoking coffee mug on her desk. That’s a wrap on season two! Thanks to everyone for reading and commenting this season, it’s been a pleasure.